Opera is in many ways the most extraordinary artistic medium of the last four hundred years. Prohibitively expensive and patently unrealistic, it can nevertheless paint the human passions with astonishing power and drama. 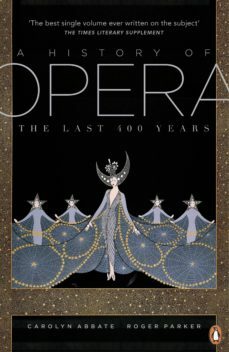 This book, the first new, full-length, single-volume history of opera for more than a generation provokes in-depth discussions of many works by the greatest opera composers, from Monteverdi, Handel and Mozart, to Verdi and Wagner, to Strauss, Puccini, Berg, and Britten. There are lively discussions of operas social, political and literary background, its economic cicumstances and the almost continual polemics that have accompanied its development through the centuries. Central to the book is an exploration of the tensions that have always sustained and enlivened opera. Abbate and Parker examine the problems that opera has faced in the last half century, when new works - which were once operas life-blood - have shrunk to a tiny minority, have largely failed to find a permanent place in the repertoire. Yet the books final message is one of celebration. Even if the majority of operas most popular and enduring works were written in what is now a remote European past, in circumstances very different from our own, and the viability of contemporary opera is ever more in question, opera as an art form remains extraordinarily buoyant and challenging. It continues to transform people physically, emotionally, and intellectually, and to articulate human experience in ways no other art form can match.